This farmers' breakfast is a whole breakfast for four in one skillet. 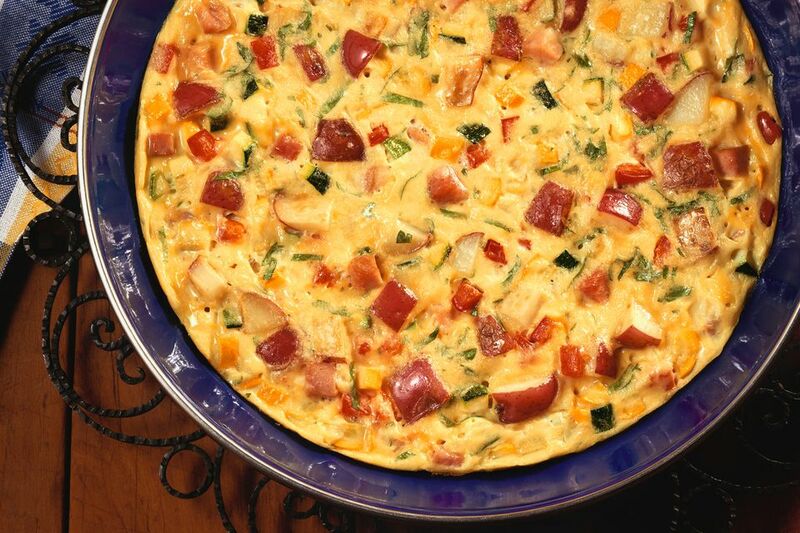 Rather than making individual omelets and hash browns or breakfast potatoes, you have it all in one dish. Once you've gotten the knack of making a skillet breakfast, you can go wild with variations. There are lots of different vegetables you can add to this dish. Practically any leftover cooked vegetables can be added. As well, you may have "aspirational vegetables" going to waste in your refrigerator and this is a chance to dice them and add them to the skillet. Change it up with breakfast meats other than bacon, or leave out the meat altogether for a vegetarian option. Season the eggs with your favorite herbs or seasoning blends. If you have a trusted cast iron skillet, be sure to keep stirring the eggs so they don't stick or burn. Using a non-stick pan can help. In a large, heavy skillet, cook bacon until crisp; remove the bacon to paper towels to drain. In the bacon drippings, cook the onion and potatoes until browned, about 5 minutes. Pour the beaten eggs into the skillet. Cook, stirring gently, until the eggs are set and cooked through. Be sure to reduce the heat and keep stirring so the egg mixture doesn't stick or burn on the bottom of the pan. Season with salt and pepper. Crumble the bacon and sprinkle it and the shredded cheese onto the cooked eggs. Let it stand a minute or two, just until the cheese melts. Serve warm and enjoy. Refrigerate any leftovers. To save time for cooking the cubed potatoes and any other hard vegetable you might add, place them in a covered dish in the microwave and cook them on high for 3 to 5 minutes until they are softened. For food safety, cooked eggs should reach 160 F as determined with an instant-read thermometer. Leftovers can be reheated in the microwave and can be rolled in a tortilla for a breakfast burrito. Green onions: Add chopped green onion tops to the potatoes about 1 minute before you add the eggs. Bell peppers: Add a few tablespoons of chopped bell peppers along with the onion, sauteeing it with the onion to cook and soften the peppers. This will add color as well as flavor. Mushrooms: Saute mushrooms ahead of time and then added them with the egg, or add canned mushrooms when you add the egg. Spinach: Tear fresh spinach into 1-inch pieces. Add it in the last minute of cooking the potatoes and onions. Ham: Instead of bacon, brown about 8 ounces of diced ham in the skillet. Sprinkle it over the top of the egg and potatoes along with the shredded cheese. Pork sausage: Instead of bacon, brown about 8 ounces of bulk pork sausage in the skillet. Sprinkle it over the top of the egg and potato mixture with the cheese.